in the Legislative Assembly of Assiniboia by Hon. Thomas Bunn, Secretary of State, Provisional Government of Assiniboia. St. Clement’s Church, shown with the bell tower built in 1928 — the church in 1870 would have appeared relatively plain and unassuming. The first residents of the portion of Red River Settlement that would eventually become known as St. Clement’s were members of the Peguis Band [see St. Peter’s Parish/ ‘the Indian Settlement’/ Peguis’ Settlement]. Métis families began to join them in settling along the banks of the Red River in the 1820s. 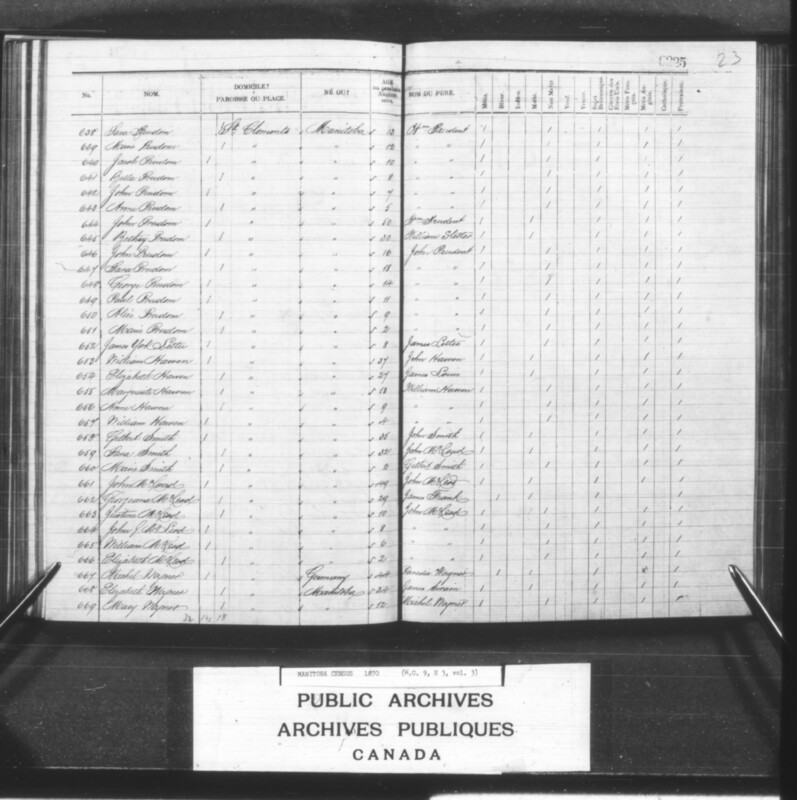 Many were families of former Non-Aboriginal employees of the Hudson’s Bay Company [HBC], who were ‘retired’ after the merger of the HBC and the North West Company [NWC] in 1821. The neighbourhood of permanent settlement that extended to the south beyond the properties of residents of Peguis’ settlement became known as Mapleton. There was a school at Mapleton by 1854 at which religious services were conducted. Planning for an actual church building was well underway by 1857, but it was not until 1861 that St. Clement’s Anglican church was completed. The church was located on the west bank of the Red River, across from the home of Thomas Bunn and Rachel Harriott on the east bank (newly built in 1862 and still standing in 2013), near the ferry that connected both halves of Mapleton. 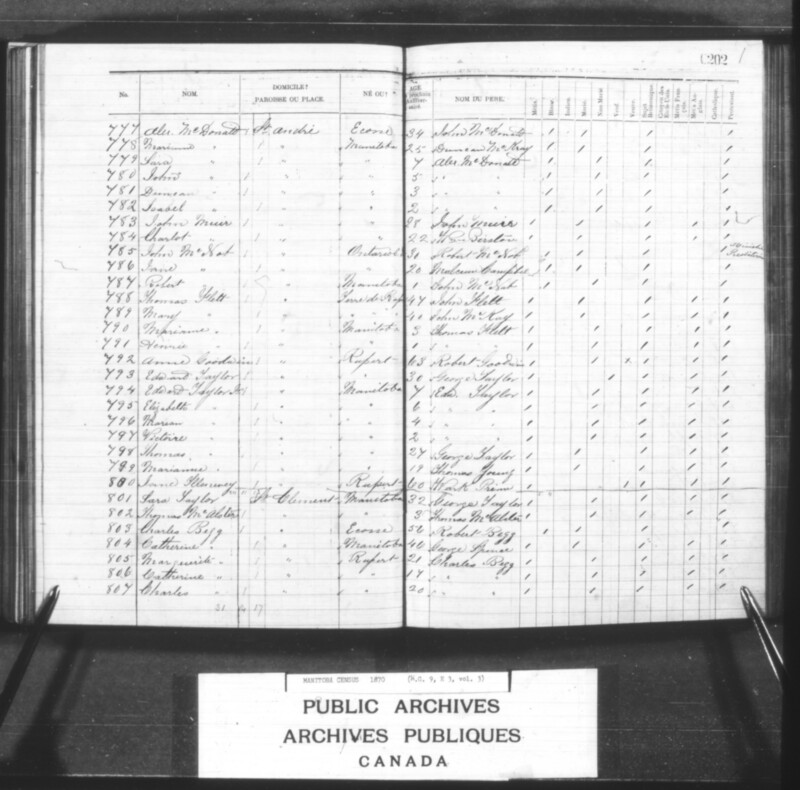 According to the Archibald Census of 1870 residents of St. Clement’s Parish were virtually all Protestant (517). The few Roman Catholic residents are designated ‘RC’ below (the census listed 9 Catholics). If there is no designation, the resident was probably Protestant — though there were 3 people whose religion was listed as “not given” on the census. – [504-508] Philip 16, Isabel 14, [Euphemia 13,] John 12, Maria 10, Joseph 8. Robert Horet took treaty with the St. Peter’s Band (Treaty 1, 1871), but later applied for scrip. [510-511] Christine 3, Anne 1. – [514-516] Sarah 8, Elise/ Elizabeth Jane 5, Robert 1. 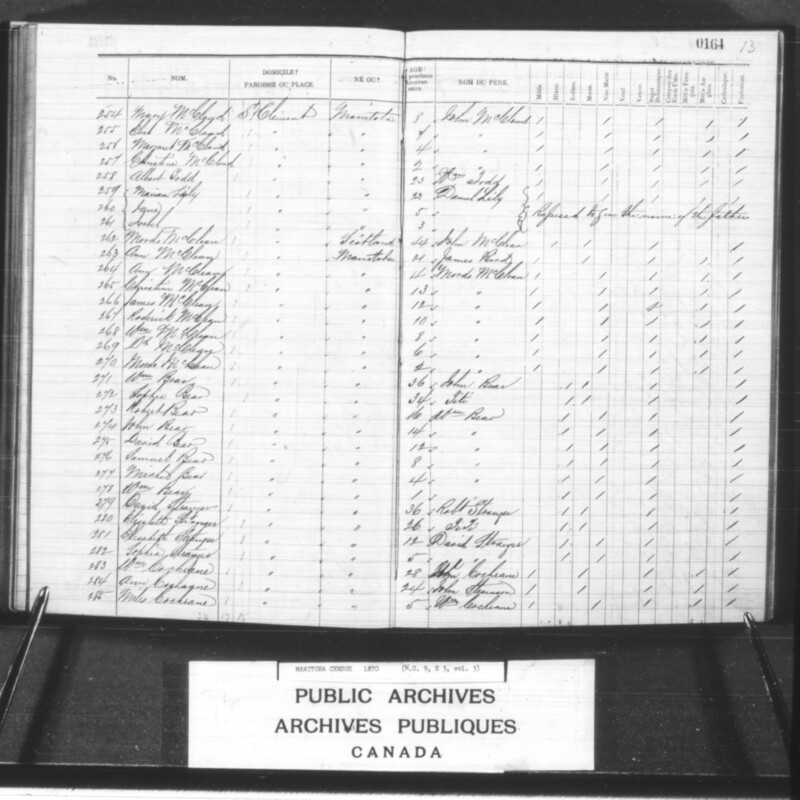 In her affidavit of 1875, Agnes Bird-Hourie was described as a resident of St. Clements on 15 July 1870. She had moved to Prince Albert Mission on the Saskatchewan River by that year. Her application for scrip was denied. Thomas Houri received scrip c. 1878. In her affidavit [not available online] Sarah described her place of birth as St. Andrew’s Parish. In 1883 she had married Moses Flammand, who had died by the time he applied for scrip. In her affidavit [not available online] Elizabeth Jane Hourie-Anderson described her place of residence the year she applied for scrip as Prince Albert [SK] and her place of birth as High Bluff. 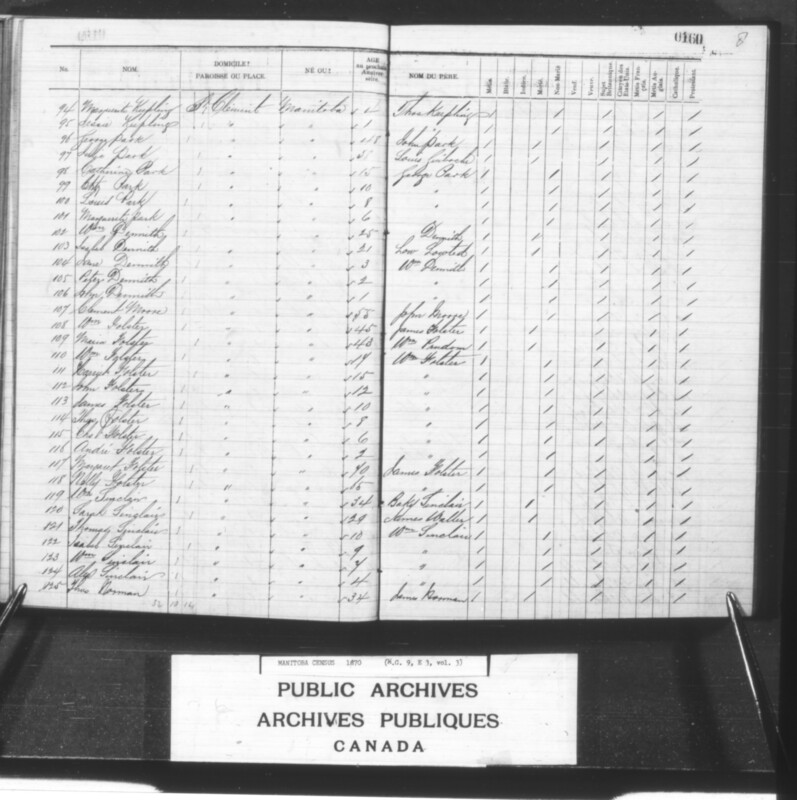 There is also an affidavit [not available online] for another son, Charles Hourie (born 1877 at Prince Albert [SK]); and an affidavit [not available online] for a daughter-in-law, Alice Margaret, married to John Peter Houri (born 1872 at Qu’Appelle; deceased). – [519-527] Margaret/ Marguerite 22/ 27 , Jane 19, Jeremie 18, Catherine 17, Sara 15, Sophie 13, Gilbert 11, Samuel 9, Marie 7. – [819-823] Marguerite 20, Anne Flora 18, Jemima 14, Alexander 12, Archibald 10. – [812-813] William Charles 5, James R. 1. 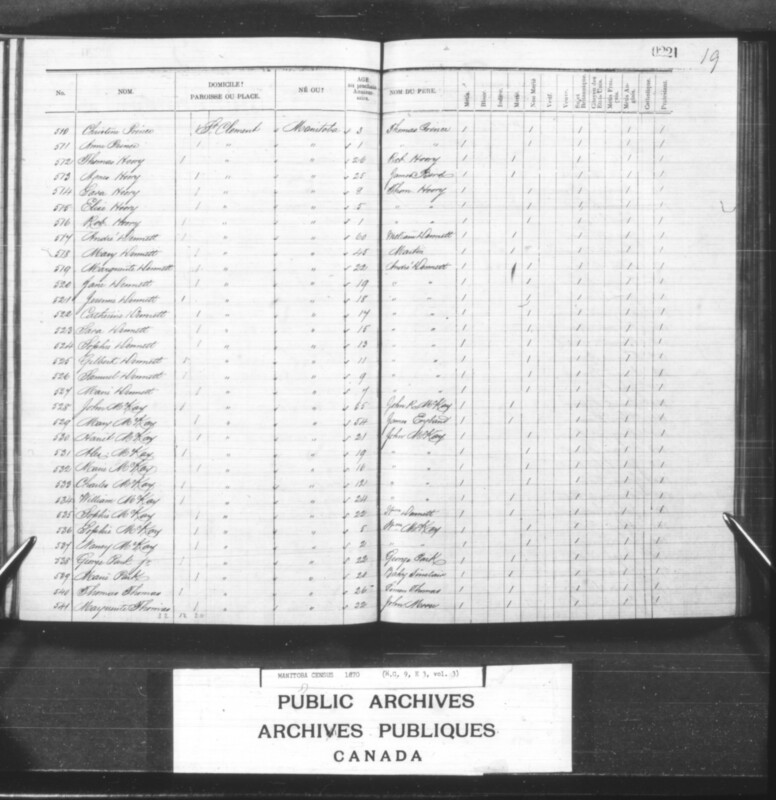 [824-825] John Spence (Métis, born 1810/ 1811 to #4435 George Spence and Catherine) married Charlotte Cook (Métis, born 1822 to John Cook and an unidentified woman). 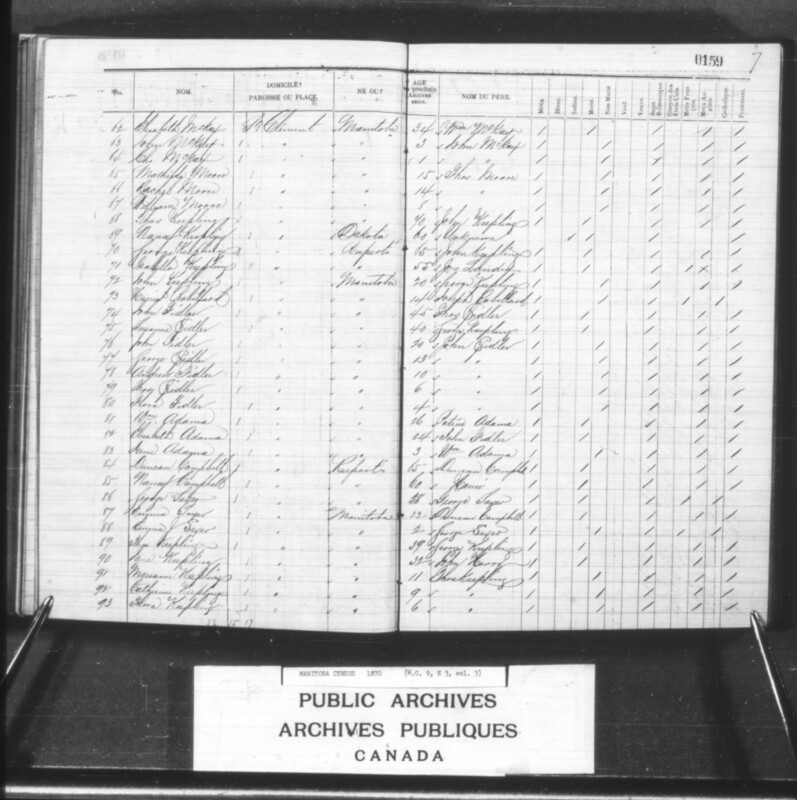 Joseph Parisien (First Nations/ Métis, born 1835/ 1841 to Jean Baptiste Parisien Jr. and Marguerite Dutemp/ Destemps; RC) married Catherine Spence (First Nations/ Métis, born 1839/ 1840 to John Spence and an unidentified Métis woman; died 1874; RC) and afterwards remarried. – [831-833] Marguerite 7, Catherine 4, John George 2. Joseph Parisien took treaty with the St. Peter’s Band (Treaty 1, 1871). He withdrew from treaty in 1874 when scrip became available, understanding (from John C. Schultz) that he would be accepted for a “HalfBreed grant” in 1875. Catherine, however, apparently continued to remain a Band member (though she had died), and the children received annuities in 1876 and 1877. James Graham, Acting Indian Superintendent, objected to the children receiving the annuity “their father being a White man,” writing to Ottawa for direction. Ottawa agreed that if Joseph Parisien qualified for scrip, he was now “a Whiteman” whose children “were not entitled to share in Indian annuities.” Joseph asked to be reinstated with the St. Peter’s Band, explaining he would never have changed his status if he had know his children would lose theirs. In addition, as of 1878, Joseph had never received his scrip (and in fact had been disallowed from qualifying for scrip because he had taken treaty annuities and not paid them back and was therefore an “Indian”). And, since Joseph was apparently still an “Indian,” he wanted the annuities that he had gone without since 1874, as well as money owed to his children for 1875 and 1878 ($65 in total). Government officials wanted to know if Joseph was “a White-man, a HalfBreed, or an Indian.” They were told he was “a French Half Breed” who was “considered an Indian” for the purpose of taking treaty in 1871. Joseph was reinstated. The family encountered additional problems in 1886, over the question of whether Catherine had in fact died, “out of treaty” as a ‘Halfbreed’ (in which case her heirs — including Joseph — could qualify for scrip), or not (one official alleged she was a “full blooded Indian” so would never have been considered for scrip; another thought that her having received $3 in 1874 meant she was an ‘Indian’ for the whole year, dead or not, since she never paid it back; another stated she was an ‘Indian’ “in the eyes of the law”). Apparently, by this time (1886) Joseph had again withdrawn from treaty to take scrip. – [837-839] Magnus 14, Catherine 11, George 5,  Elise 2. – [805-807] Margaret 21, Charles J. 20, Catherine 17, [808-809] John J. 16, Robert I. 11. – [843-844] Henry George 21, Mary 16. – [847-852] John 16, William 14, Henri 12, Miles 9, Edward 4, James 1. 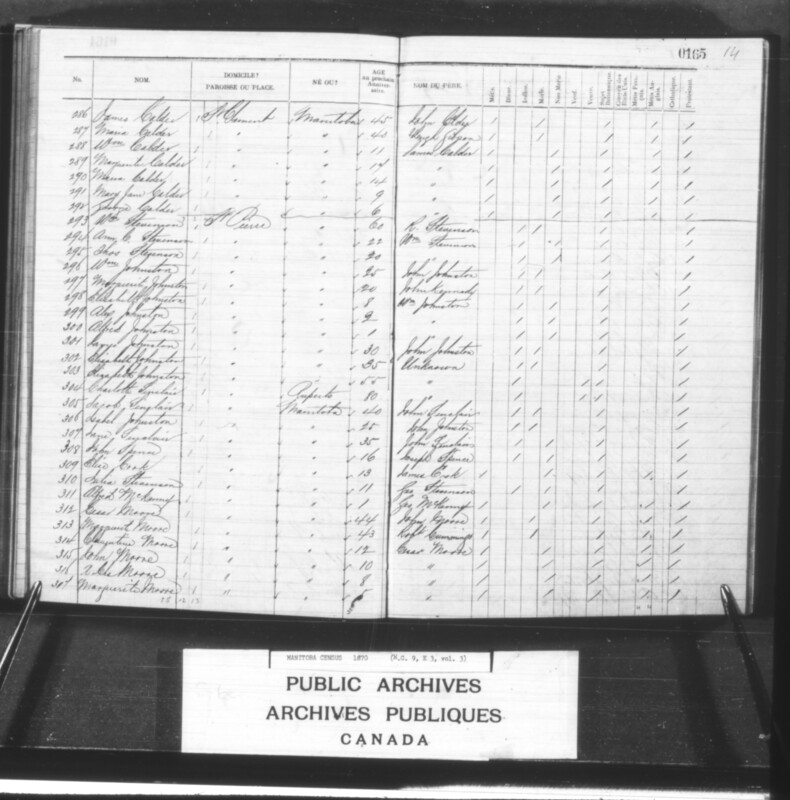 [853-854] Thomas Lyons Jr. (Métis, born 1837/ 1838 to #3013 Thomas Lyons Sr. and Charlotte Pruden) married Eliza Isbister (Métis, born 1850/ 1851 to #2373 William Isbister and Mary). – [859-864] Catherine 18, Albert 15, Matilda 10, Miles 8, Joseph 6, Mary 3. 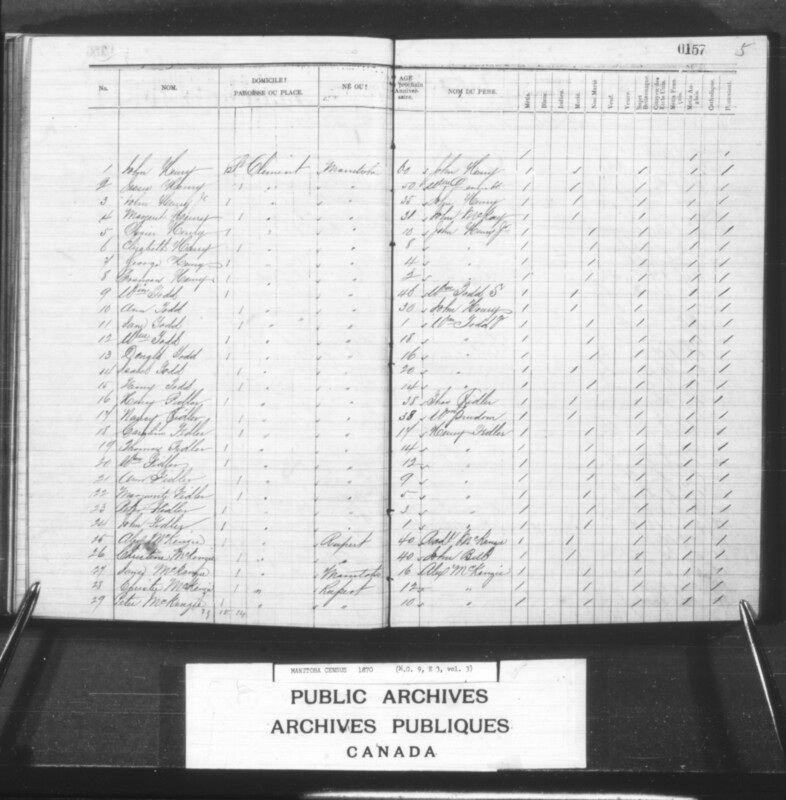 [865-866] John Daniels (Métis, born 1845 to #1017 John Daniels and Jane) married Anne ‘Annie’ Calder (Métis, born 1847/ 1849 to #626 George Calder and Charlotte Lyons). – [869-870] John Thomas 6, Maria 2, [Charlotte 0]. 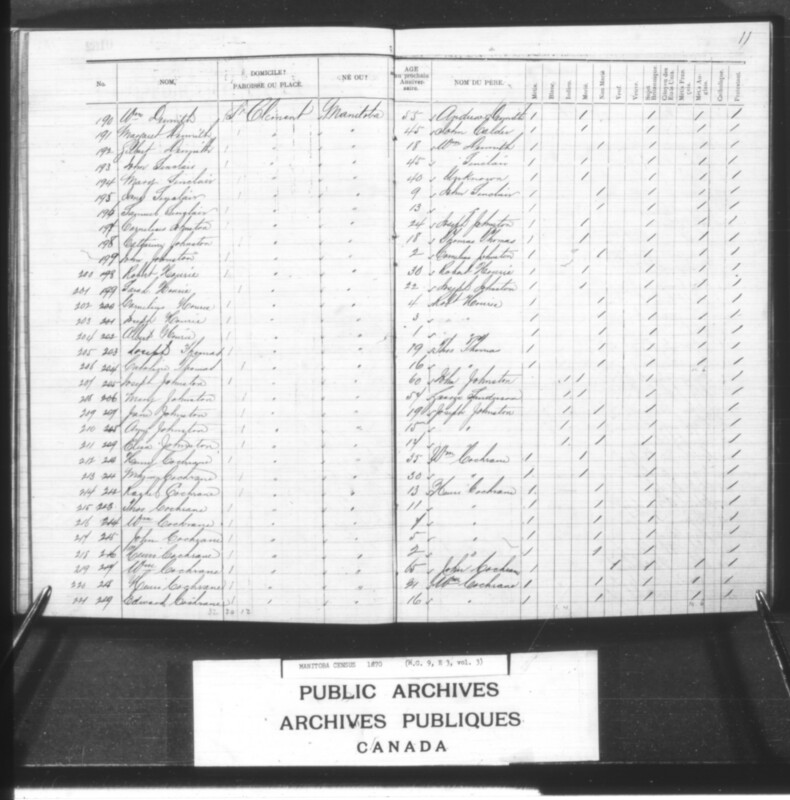 [1-2] John Henry (Métis, born 1810 to John Henry and an unidentified woman) married Jessie Denault (Métis, born 1820 to William Denault and an unidentified woman). – [5-8] Oliver 10, Elizabeth 8, George 4, Francois 2. – [11-15] Isabel 20, William 18, Donald 16, Fanny 14, Jane 1. – [18-24] Caroline 17, Thomas 14, William 12, Ann 9, Marguerite 5, Peter 3, John 1. – [27-29] Jane Ann 16, Christiana ‘Christie’ 12, Peter Lawrence 10, [30-32] Alexander [Alice Margaret] 8, Alexander George 6, Anabella Mary 4. [?] Lager/ Leger/ Parisien dit Leger? or Lagarde/ Leguarde? (born 1820; deceased) married  Nancy Captain (First Nations, born 1824 to Joseph Captain and an unidentified woman). – [47-48] Ann 4, Victoire 3. – [46-49] Elizabeth 11, Christine 9, Niel 4, Angus 2. – [52-54] Charles 12, Alexander 8, Alfred 4. – [57-60] William 10, Elizabeth 8, Ann S. 5, John 3. – [63-64] John 3, Charles 1. [68-69] Thomas Kipling (Métis, born 1792/ 1800) married Nancy (First Nations, born 1800/ 1810 in Dakota). – [76-80] John 20, George 13, Andrew 10, Thomas 6, Flora 4. 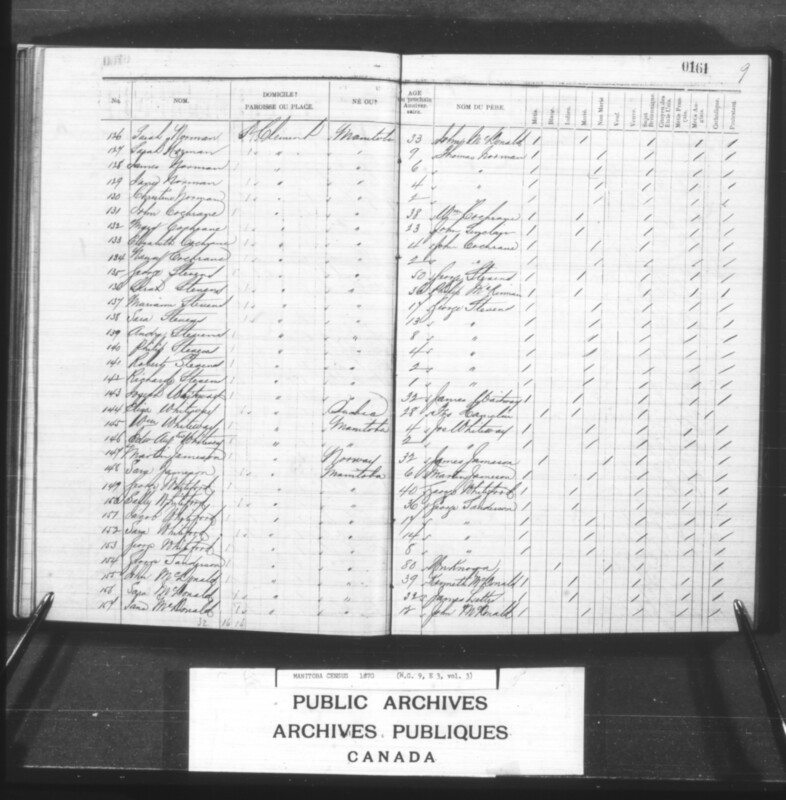 [84-85] Duncan Campbell (Métis, born 1810/ 1815 to #661Duncan Campbell and Catherine) married Nancy Henry (Métis, born 1810/ 1820). – [110-116] William 17, Harriet 15, John 12, James 10, Thomas 8, Charles 6, Andre 2. – [121-124] Thomas 10, Isabel 9, William 7, Alexander 4. – [127-130] Sarah 9, James 6, Jane 4, Christine 2. – [133-134] Elizabeth 4, Nancy 2. – [104-106] Jane 3, Peter 2, John 1. – [91-93] Marianne 11, Catherine 9, Flora 6, [94-95] Marguerite 4, Jessie 1. – [288-392] Marguerite 17, Maria 14, William 11, Mary Jane 9, George 6. – [195-196] Samuel 13, Jane 9. – [137-142] Marianne 17, Sara 13, Andre 8, Philip 4, Robert 2, Richard 1. – [145-146] William 4, Edward Augustus 2. George Sanderson (Métis, born 1790) married Lisette Lagemoniere (Métis, born 1803; deceased). George Sanderson (First Nations, born 1800) married Nancy (First Nations, born 1810). –  Jane 12, [158-161] Elizabeth 10, William 6, Ann 4, Helen 2. 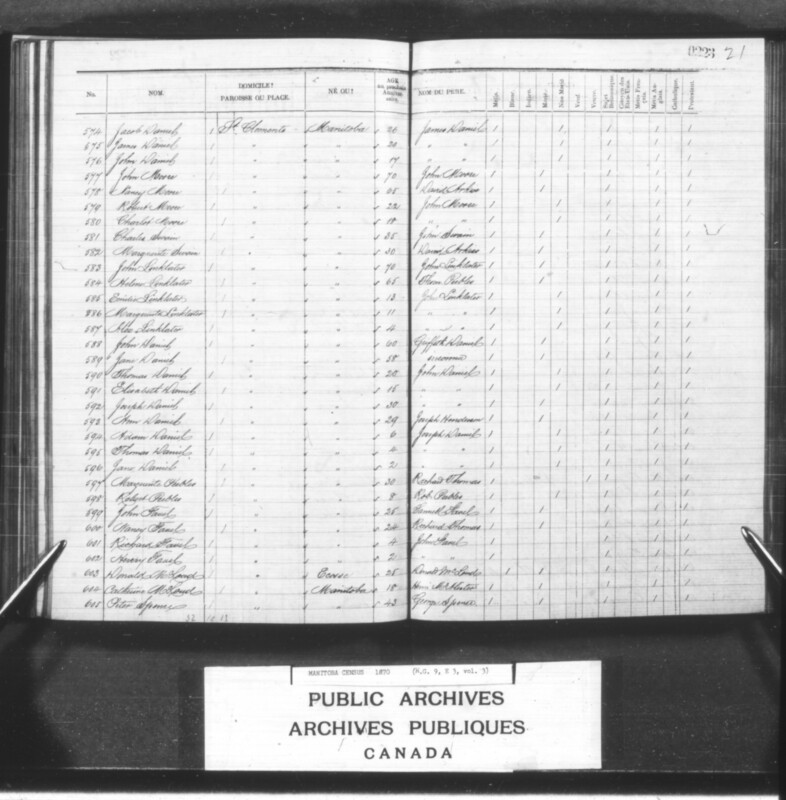 [163-164] John Garrioch/ Garrec (Métis, born 1810 to John Garrioch) married Sophia Sanson (Métis, born 1810/ 1814). – Elise 8, John 6, Thomas 4, William 1. – [167-170] Elsa 8, John 6, Thomas 4, William 1. – [173-178] James 19, Joseph 17, John 15, Abraham 13, Elise 5, Elizabeth 5. Took treaty with the St. Peter’s Band (Treaty 1, 1871). – [181-182] Catherine 9, George 2. – [185-189] Victoria 6, Mariann 4, George 3, Harriet 2, Sarah 1. – [209-211] Jane 19, Elisa 17, Ann/ Annie ‘Nancy’ 15. Joseph Columbia Johnston was a “HalfBreed” farmer whose family took treaty with the St. Peter’s Band (Treaty Number 1) in 1871. But, in December 1881 he applied to withdraw, at the cost of $50 (returning the annuities he had received to that time). James Graham, the Superintendent of Indian Affairs at Winnipeg, objected to Joseph taking Métis scrip, if his wife and children continued to be ‘Indians’ and draw annuities. Joseph clarified that his wife and the one daughter who lived with him would also withdraw from treaty to claim Métis scrip. Mary and Jane gave affidavits to that effect. The family was asked to pay back $195. Deputy Superintendent General of Indian Affairs, S. Vankoughnet then weighed in, declaring that he would review the Treaty. Joseph repaid all of the annuity monies received by his family (including by other individuals than himself, Mary, and Jane). Canada accepted the $195, and decided not to investigate the question of whether a family could simultaneously consist of ‘Halfbreeds’ and ‘Indians’ any further. After Joseph Johnston died (some time before 1886), Mary and Jane finally received scrip, in the amount of $26.66 each (as did a number of his other children: Eliza Johnson-Holgate, Annie ‘Nancy’ Johnson-Hall, and Sarah). Cornelius Johnstone took treaty with the St. Peter’s Band (Treaty 1, 1871). He apparently withdrew from treaty to take scrip c. 1886. – [202-204] Cornelius Robert 4, Joseph 3, Albert 1. – [214-218] Rachel 13, Thomas 11, William 7, John 5, Henri 2. – [220-221] Henry 21, [Hugh 18,] Edward 16. 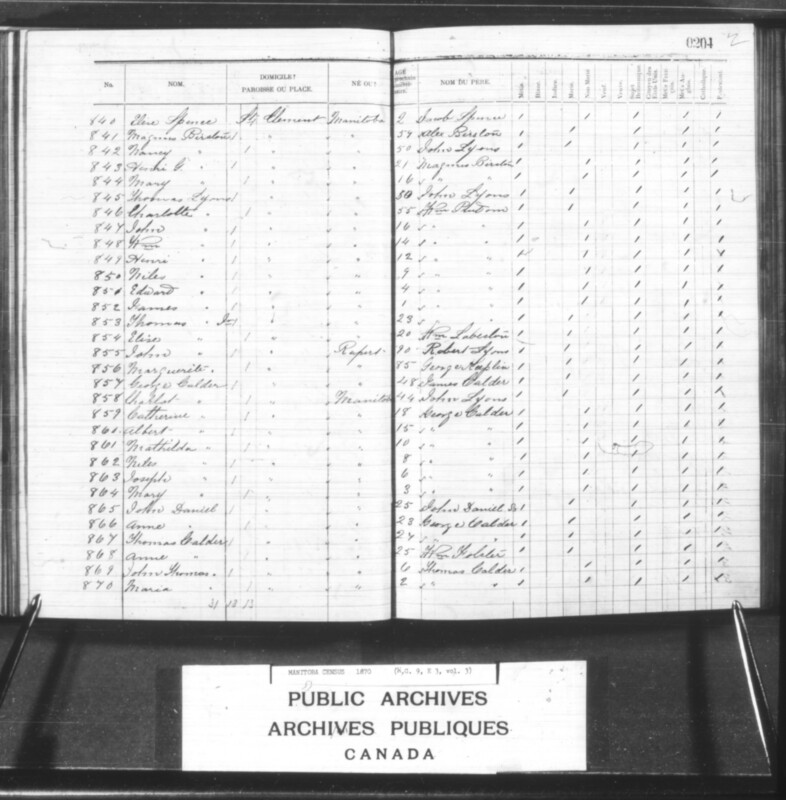 According to William’s affidavit of 1875, he and his wife were Métis and resident farmers of St. Clement’s Parish. They had a son named Henry Cochrane (born 1851; farmer at St. Clements). – [225-228] John 7, Colin 5, Duncan 3, Margaret 1. – [231-232] Margaret 10, Mary 3. 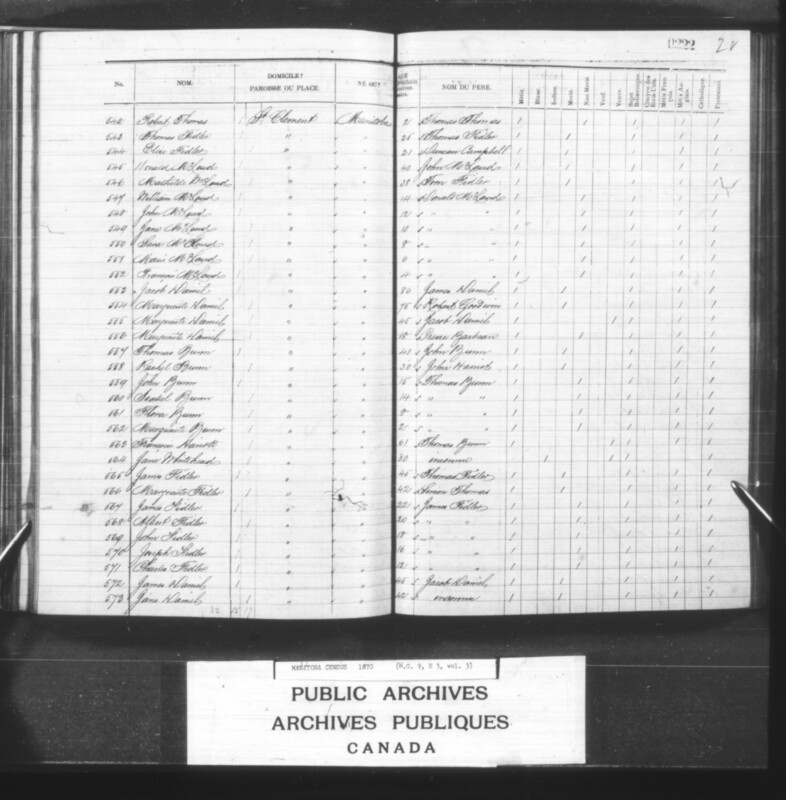 William Tait (Métis, born 1827 to #4630 William Tait and Mary Bear) married Catherine Peebles (born 1831). – [237-240] William 22, Jane 18, Mary 16, Elizabeth 11. 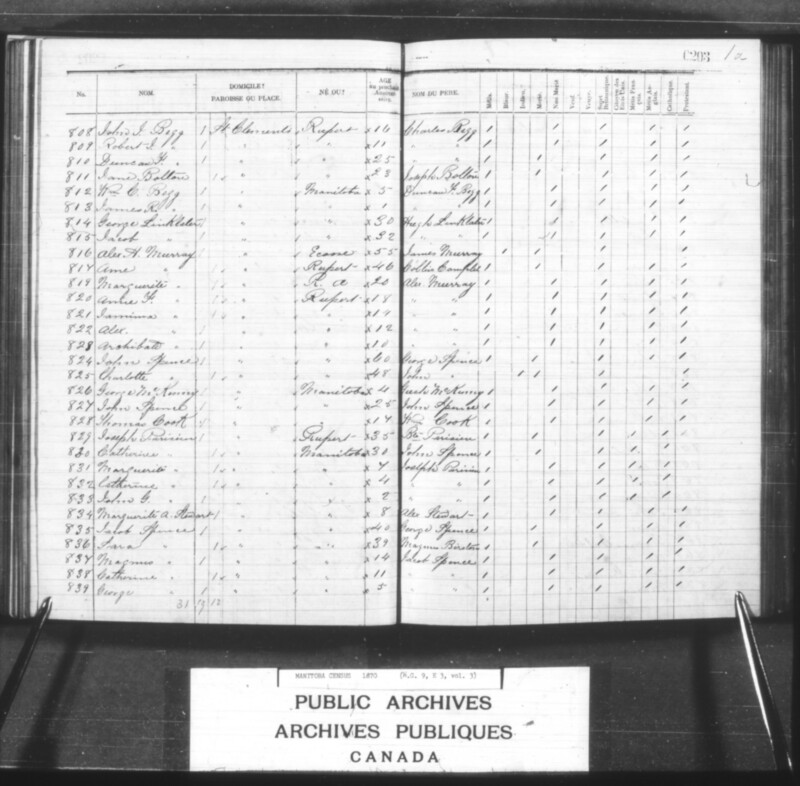 [258-259] Albert Todd (Métis, born 1847 to William Todd and an unidentified woman) married Marian Lily (born 1847 to Daniel Lily and an unidentified woman) and/ or Marie McKay (born 1856)? – [260-261] Jane 5, Isabel 3.
nb: the note “refused to give the name of the father” appears beside the names of the woman and children on the census form. – [264-270] Christine 13, James 12, Roderick 10, William 8, Donald 6, Ann 4, Mordo 2. [271-272] William Bear (Métis/ Cree First Nation from Cumberland House, born 1834 to John Bear and an unidentified woman), married Sophie (First Nations, born 1836 to Tité/ Ti Té and an unidentified woman). – [273-278] Robert 16, John 14, David 12, Samuel 8, Michel 4, William 1. Note: Several William Bears seem to have been conflated in Sprague and Frye’s tables. See HBCA “Bear, William (b. ca. 1810) (fl. 1856–1861),” biographical sheet. See also “White Bear (Mes-Ka-Nee-Powit) aka Turner (c1780-1844),” Red River Ancestry. – [281-282] Elizabeth 12, Sophia 5. David Stranger took treaty with the St. Peter’s Band (Treaty 1, 1871). – [252-253] Mordo 11, John 9, [254-257] Mary 8, Elise 7, Margret 4, Christine 2. – [243-249] Joseph ‘Joe’ 22, Catherine 18, Mary 16, Thomas 13, Elizabeth 11, Benjamin 3, Jane 1. Joseph ‘Joe’ Badger took treaty with the St. Peter’s Band (Treaty 1, 1871). Joseph Badger moved his family west (c. 1874), in company with John Badger (who became a minister c. 1885) and Peter Badger. John Badger and family moved west (c. 1874), in company with the families of Joseph ‘Joe’ Badger and Peter Badger of St. Peter’s. They settled at the ‘Isbister Settlement‘ (later renamed Prince Albert SK), about halfway between Carlton and Fort la Corne. John Badger later became a minister (c. 1885). – [536-537] Sophie 5, Nancy 2. – [530-533] Harriet 21, Alexander 19, Marie 16, Charles 12. 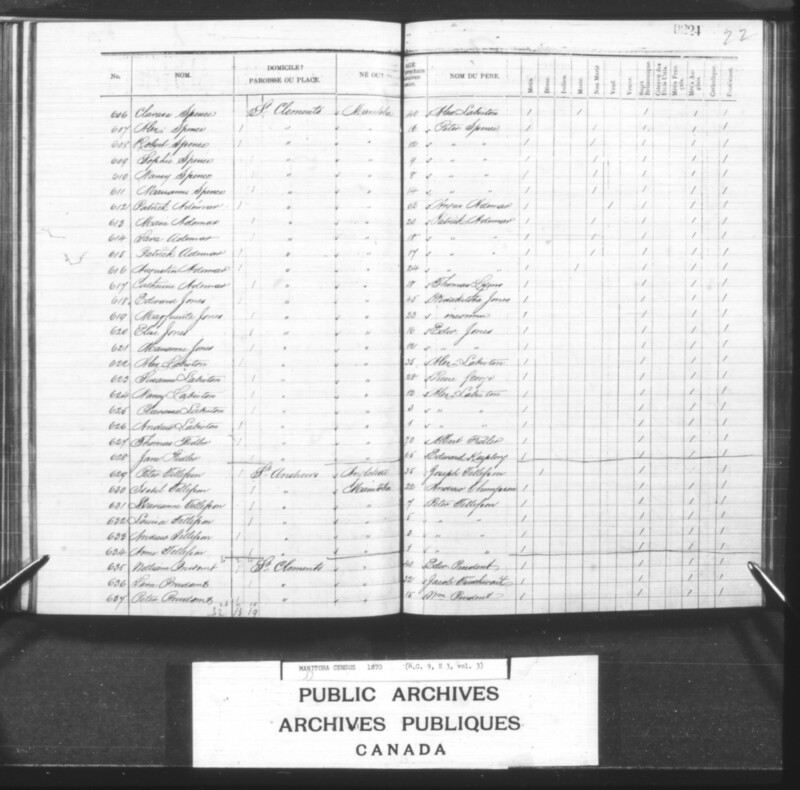 [538-539] George Park Jr. (Métis, born 1847/ 1848 to #3846 George Park and Julie Guilboche) married Marie Sinclair (Métis, born 1850 to Bakie Sinclair and an unidentified woman). – [98-101] Catherine 15, Charles? 10, Louis 8, Marguerite 6. –  Peter 15, [638-643] Sara 13, Marie 12, Jacob 10, Bella 8, John 7, Anne 5. – [646-651] Sara 18, John 16, George 14, Paul 11, Alice 9, Marie 2. – [655-657] Marguerite 13, Anne 9, William 4. – [663-666] Justine 10, John G. 8, William 6, Elizabeth 2. – [631-634] Marianne 7, Louisa 5, Andrew 3, Anne 1. – [547-552] William 14, John 12, Jane 10, Sarah 8, Marie 6, Francois 4. 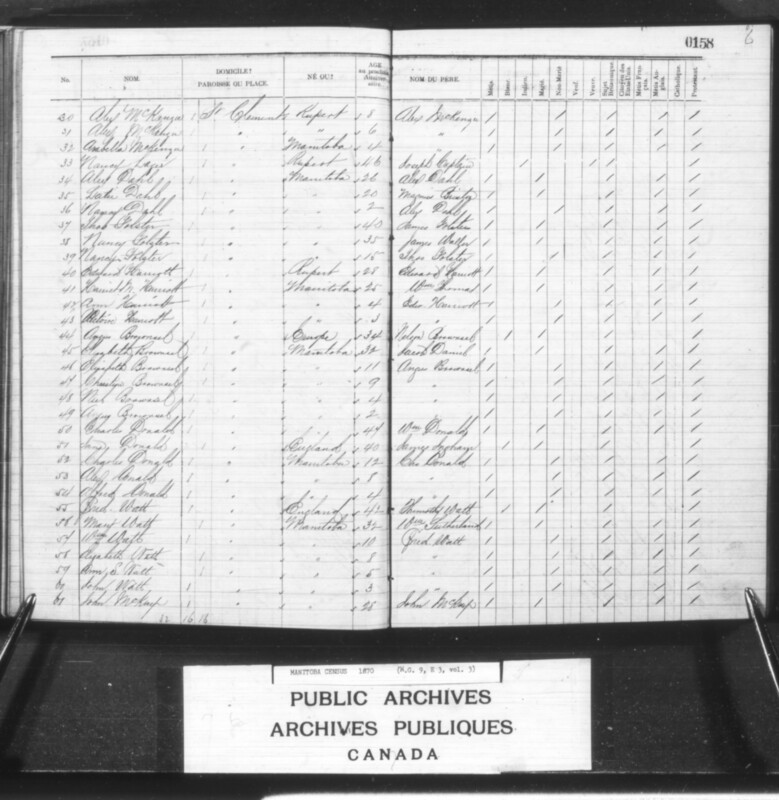 [603-604] Donald McLeod/ McLoud (Scottish, born 1845 to Donald McLeod and an unidentified woman) married Catherine McCorrister (Métis, born 1852 to Henry McCorrister and an unidentified woman). 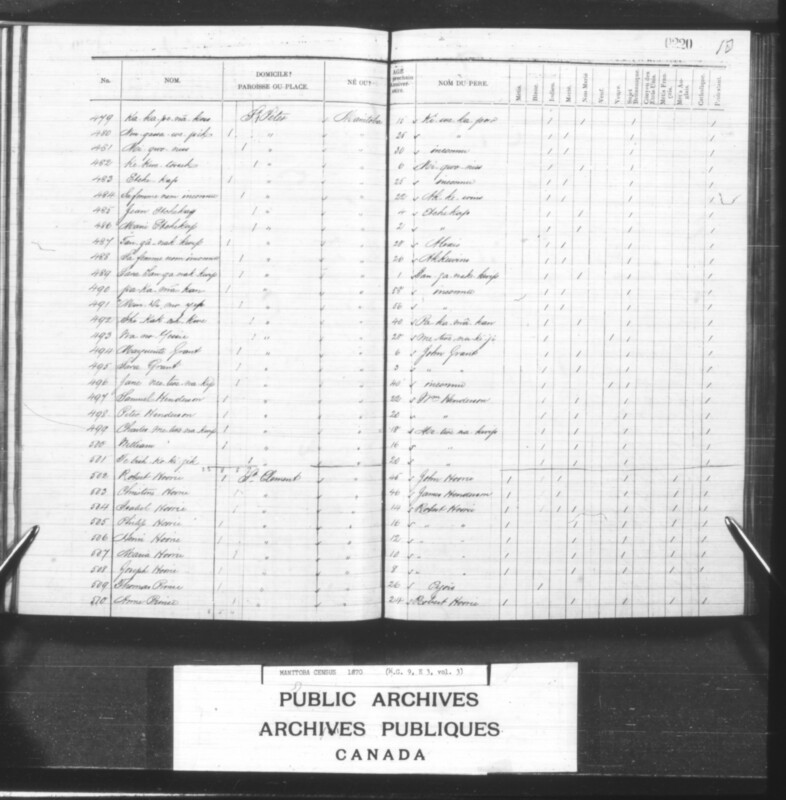 [553-554] Jacob Daniel/ Daniels (Métis, born 1790/ 1792 to James Daniel and an unidentified woman) married Margaret/ Marguerite Goodwin (Métis, born 1795 to Robert Goodwin and an unidentified woman). 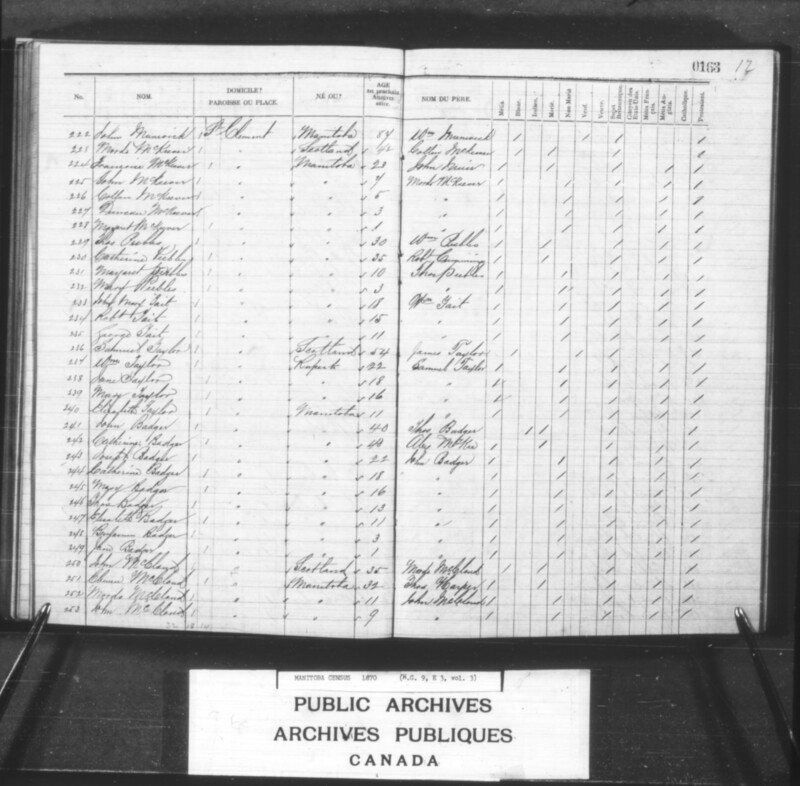 [543-544] Thomas Fidler (Métis, born 1845/ 1848 to #1549 Thomas Fidler and Jane Kipling) married Elise Campbell (Métis, born 1849 to #660 Duncan Campbell and Nancy Henry). [627-628] Thomas Fidler (Métis, born 1798/ 1800 to #1534 Albert Fidler and an unidentified woman) married Jane Kipling (Métis, born 1805 to Edward Kipling and an unidentified woman). – [624-626] Nancy 12, Clarrissa 3, Andrew 1. – [567-571] James 22, Albert 20, John 18, Joseph 16, Charles 12. – [559-562] John 15, Isabel 14, Flora 8, Marguerite 2. – [574-576] Jacob 26, James 20, John 17. – [590-591] Thomas 20, Elizabeth 15. – [585-587] Emilie 13, Marguerite 11, Alexander 4. – [577-578] Robert 22, Charlotte 18. 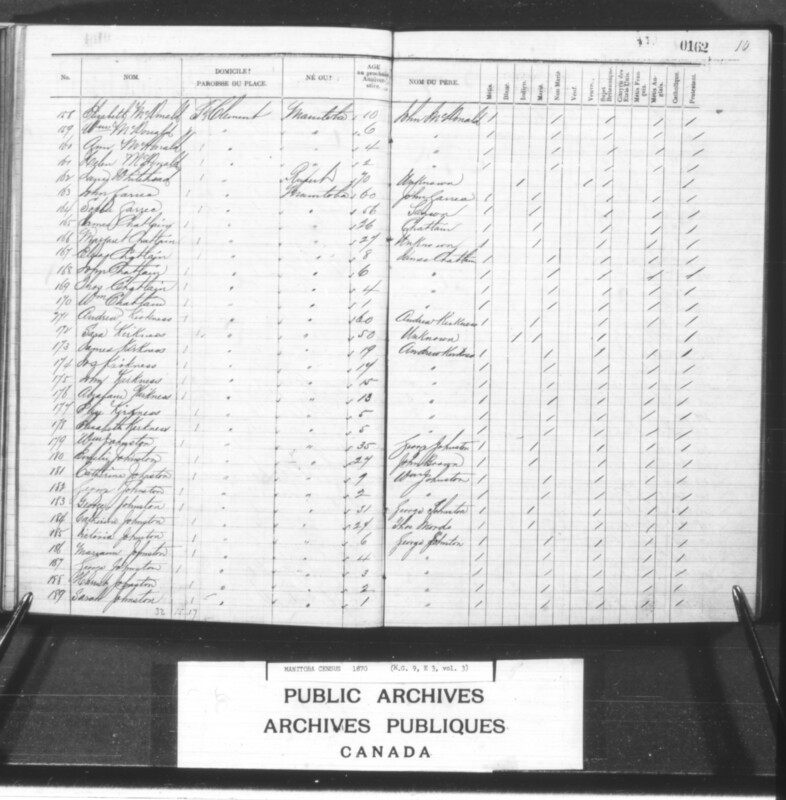 [581-582] Charles Swain (Métis, born 1835 to John Swain and an unidentified woman) married Marguerite Arcus/ Arkiss/ Arkos (Métis, born 1840 to David Arkiss and an unidentified woman). – [594-578] Adam 6, Thomas 4, Jane 2. – [601-602] Richard 4, Henry 2. – [607-611] Alexander 16, Marianne 14, Robert 12, Sophie 9, Nancy 8. – [613-615] Marie 20, Sara 18, Patrick 17. – [620-621] Elise 16, Marianne 12. If you have any additional information that would be very helpful! Good to meet you Janine, and thanks for the tip about Isobel: if I find anything more I will definitely let you know. Thank you! I’m trying to research my family tree and I know that a Rev David Stranger was once married to Isobel/Isabel in Sandy Lake (Saskachewan). David worked with Rev John Hines from England. For the life of me I can’t find any info about their kids? I’m trying to locate a birth certificate or baptism for her son Hecter or Hector. Hi! Doing family genealogy research. Looking for any information for William Adhemar( b. about 1844). I believe he is the son of Patrick Adhemar and Nancy Rose (or mother could be Elizabeth (Eliza?) Fiddler (Fidler? )I am finding conflicting information. Also there are many spellings for Adhemar. Current ancestry finds spell it Adhemar or Ahdemar. Old findings spell it Ademar. He would be my 3rd Great grandfather.